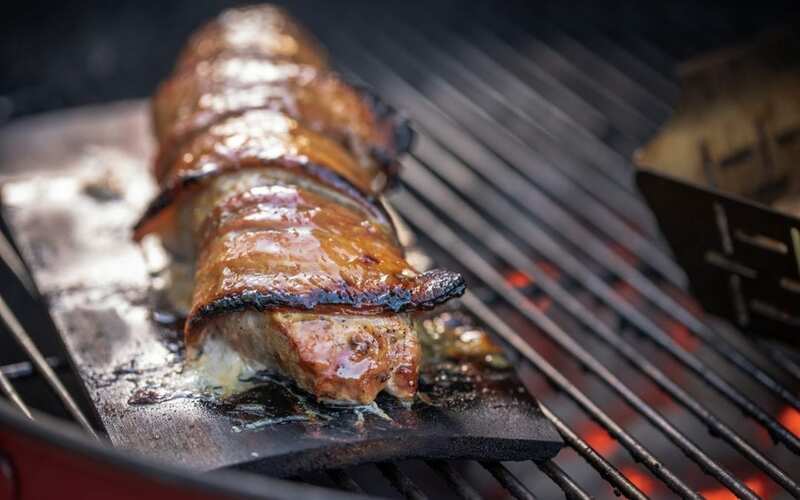 As if a bacon wrapped pork tenderloin wasn’t delicious enough, the honey and dijon mustard glaze takes this recipe to the next level! 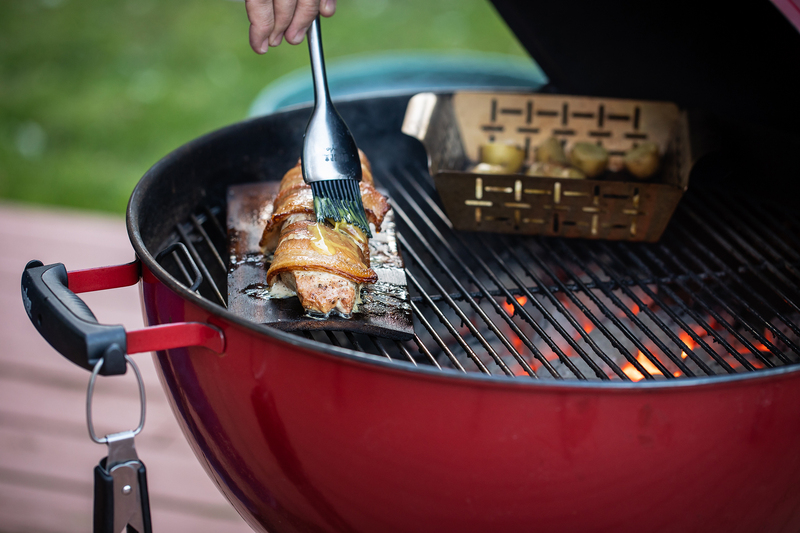 To prepare your grill for two-zone cooking position all the charcoal on one side of the grill. The side of the grill with the coals will be your high-heat cooking environment, and the other side of the grill is your indirect heat zone. Soak grilling plank in hot water for at least 15 minutes and prepare a grill for two-zone medium heat (350° – 450°F). Remove silverskin and excessive fat from the tenderloin and then season generously with salt and pepper. Place the empty plank on the grill over direct heat. Grill until marked, about 2 minutes, and remove. Wrap the tenderloin in bacon starting at one end in a continuous twist, like a candy cane. Place the bacon wrapped tenderloin on the plank. In a small bowl, combine the mustard, honey, and vinegar. Place the loaded planks over direct heat and grill with the lid closed for 5 minutes. Move the plank to indirect heat and continue to grill another 10 minutes. Baste the meat with the honey mustard glaze and continue to glaze every 5 minutes until the internal temperature of the pork reads 145°F with an instant-read thermometer. Slice and serve with any remaining glaze. Mike is the eye, mind, and stomach behind the blog Another Pint Please, which, for the last decade has been used to share his love of grilling, beer, and photography. Initially starting as a way to share what he had on the grill for dinner every night, it has morphed into another career. 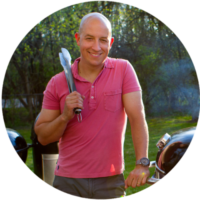 When he’s not taking photos for his own blog he’s acting as the “Grillographer” for Weber Grills and working his day job as a police sergeant.